All transactions are safe and secure with a reliable history in online purchasing behind each of our associates. 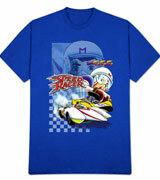 Buy the Speed Racer Mach 5 Action t-shirt to own Speed Racer clothing and merchandise. Let everyone know who the speed demon really is in this attractive action-packed Speed Racer logo shirt. The fun and stylish tee is great for a day at the amusement park or just hanging out with friends. A vintage Mach 5 shield logo sits across the middle of the tee, with Speed in various action scenes around it. This Speed Racer merchandise item will have you singing, "Go Speed Racer Go!" It is available on a variety of different color fabrics. In addition to the Speed Racer Mach 5 Action tee above, browse the Speed Racer Clothing Gallery for more apparel like men's and women's clothes, kids shirts or hoodies.